Ume started to blossom and spring is near . However cold days still continues. Despite coldness of outdoor, inside of training facility has pool with some steam coming out from water surface creating somewhat southern ocean atmosphere. However participants trained so enthusiastically that creating even hotter atmosphere. Let us introduce HUET today. Participants of this training are generally ready to do it whether they are scared or not. However there are several steps, increasing difficulty step by step, which allows trainee with no swimming skill to complete program. In photo above you can see trainees practicing EBS (Emergency Breathing System) before they go in to the helicopter simulator . 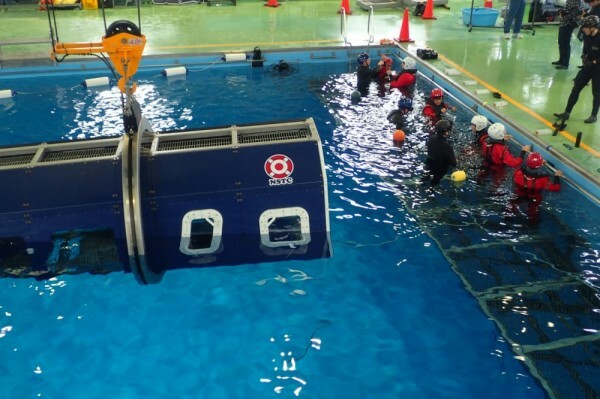 Most of trainees are nervous before they go into helicopter simulator for actual underwater escape training. Instructor try talking to trainees in order to buffer their nervous feeling, and sometimes instructor may tell foolish joke in the process . The joke may not so funny however instructor is only trying to relax you, so please excuse his him for it. As long as you follow the procedure, it is not as difficult as you imagine. Thank you for your very encouraging comment. We strive to provide training in a way that remained in participants’ memory. We are looking forward to have you back here for training.